by Eugen Rosenstock-Huessy, as Angewandte Seelenkunde. Translated by Mark Huessy and Freya von Moltke. Edited by Clinton C. Gardner. Argo, 1988. This book is a translation of Rosenstock-Huessy’s Angewandte Seelenkunde, his first attempt to formulate his new methodology for the social sciences based on the inherent structure of speech, which is the basic social reality. Rosenstock-Huessy himself wrote: “When Thomas Paine exclaimed: ‘These are the times that try men’s souls,’ he did not mean men’s bodies or men’s minds. And we know it.” In this book devoted to knowledge of that mysterious entity, the “soul,” which neither philosophers nor psychologists will have anything to do with, Rosenstock-Huessy gives that entity essential, practical meaning. Without recourse to anything mystical, transcendental, or poetic, he assures us of the reality of the individual soul for healthy human beings, and connects it to his larger work on an entirely new grammar that elevates to primacy the imperative and vocative forms of speech. 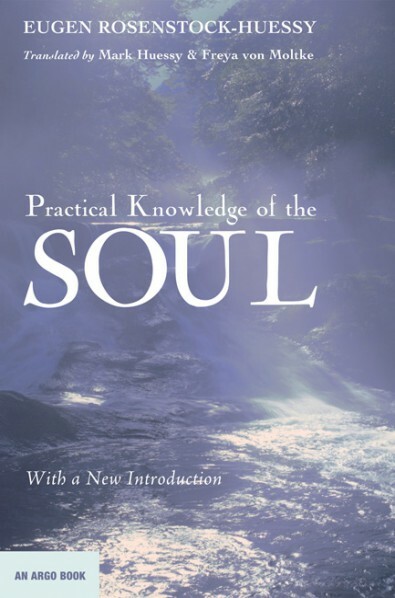 This edition of Practical Knowledge of the Soul brings to light a document long hidden from those who read Rosenstock-Huessy’s works in English. With a new introduction by Hans van der Heiden, Otto Kroesen, and Henk van Olst. Wipf and Stock, 2015. Paperback, 116 pages.